Beijing’s record-breaking air pollution has spurred officials and designers to come up with innovative solutions – and the architects at London-based Orproject recently proposed the creation of gigantic Bubbles filled with fresh air! 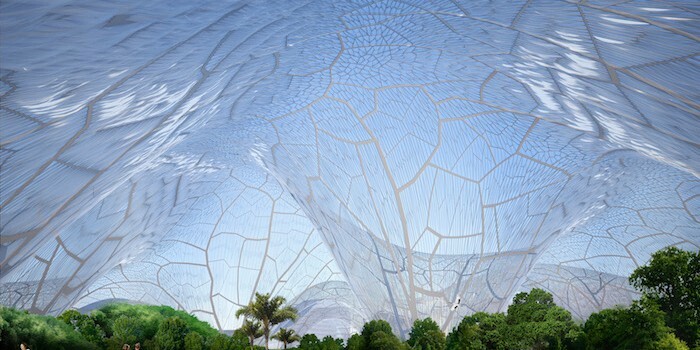 The inflatable spaces would contain parks and botanical gardens that provide fresh air to residents sick of choking on the city’s ever-present smog. Orproject is an innovative design practice founded in 2006 that tends to explore advanced geometries with an ecological leaning. Bubbles is based on a lightweight structural system developed to mimic butterfly wings and the veins of leaves. The system utilizes a material known as ETFE, which is the same material used in China’s National Swim Center at the Beijing Olympics in 2008. This transparent and stretchy plastic could be used to create wonderful domes that allow light in while protecting inhabitants from pollution. Unlike other automakers that mass produce their vehicles, Local Motors co-creates vehicles with a global community of designers, engineers and enthusiasts. So far the group has produced one car, the Rally Fighter, and now it has signed a contract to build a 3D-printed electric version of the vehicle for the Association for Manufacturing Technology (AMT). 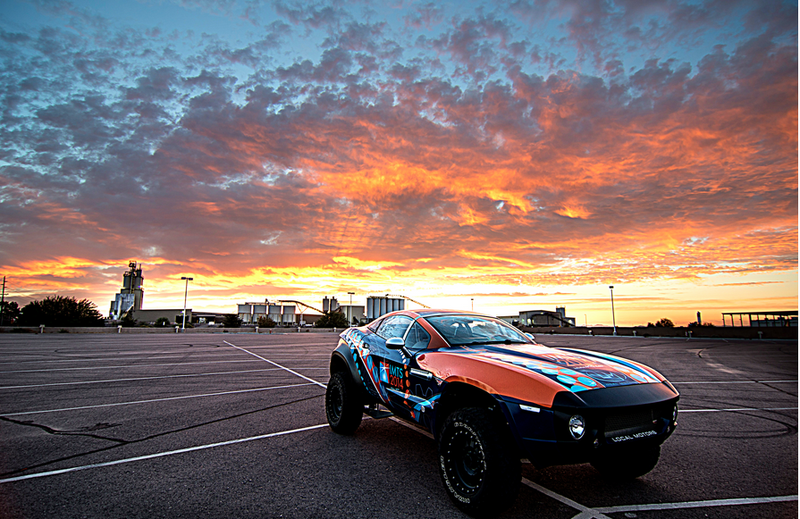 The Rally Fighter electric vehicle is set to be the first direct digitally manufactured vehicle to debut at the 2014 International Manufacturing Technology Show in Chicago, which takes place in September. The 3D-printed Rally Fighter designed by a global community will be built to meet the city’s growing urban transportation needs. Local Motors is set to change the way we think about buying cars, since its business model focuses on building small scale vehicles that are actually designed by potential customers. A few other automakers are doing similar projects, but most of those Rolls-Royce and Bugatti models are far out of reach for the average consumer. Local Motors hopes that its crowdsourced cars will make customized vehicles more accessible to more people. Google has just unveiled a new online tool called Global Forest Watch that allows organizations and everyday people to monitor deforestation around the world. More than 40 organizations are collaborating on the site, which tracks the gain and loss of tree cover around the world using a combination of satellite data, crowdsourcing, and open data to show the state of the world’s forests in near real-time. The site is designed to be easy to use and understand, showing separate maps of forest loss and gain over the present and past fourteen years, as well as maps of global tree cover, protected regions and conservation efforts, and more. Visitors to the site can view a map of the world for an idea of the big picture, or zoom in to see what’s happening in their own backyards. There’s more the the site than simply giving visitors the ability to sit back and watch the world’s forests change, however. Global Forest Watch also wants to empower individuals, governments, companies, and NGOs to monitor logging operations. Corporations can use the tool to ensure their supply chain is sustainable, governments can identify illegal clearing operations, and residents in affected areas can report violators in their communities. The Sierra Club has put together a list of “The 5 Worst Foods for Environmentalists to Eat.” For many of you, this list probably doesn’t hold many surprises, but it is still an important reminder of the decisions we as consumers make on a daily basis when choosing what to put into our bodies. Some foods, like it or not, are best avoided completely, no matter how delicious they may taste. From an environmental standpoint, it’s crucial to buy shade-grown, organic coffee. (Fair trade is also important for the growers.) Coffee is meant to grow in the shade, but many farmers now grow it in full sunlight, with a heavy dependence on pesticides, herbicides, fungicides, and fertilizers. They also chop down rainforests, destroying bird habitats. Look for the green gecko stamp from the Rainforest Alliance when purchasing coffee. “Cheap burgers are environmental assassins,” says Logan Strenchock, Central European University’s sustainability officer. Forests are clear-cut to grow the GMO corn and soy used to feed cows. Those crops have awful pesticide runoff that contaminate waterways, not to mention the waste generated by keeping large numbers of cows in CAFOs (concentrated animal feeding operation). Even grass-fed beef “depletes native biodiversity, increases invasive exotics, diverts water, fouls streams, and bares the soil,” according to Mary O’Brien, director of the Utah Forests Program. Then the fresh meat has to be kept cool till it’s used, requiring vast amounts of energy. Palm oil is used in half of all packaged foods sold in the U.S., particularly cookies, crackers, and soups. Pam oil is the largest cause of rainforest destruction, resulting in huge swaths of Indonesian and Malaysian rainforests being bulldozed in order to plant palm oil trees. “Eight million acres have been cleared and burned already, and the orangutan is on its way to extinction,” says Christy Wilhelmi, author of Gardening for Geeks. The solution? Ditch those packaged foods, start cooking from scratch, and always, always read labels. GMO corn “destroys habitats, depletes soils, breaks nutrient cycles, pollutes air and water, contaminates native maize varieties, and on and on,” according to Douglas Fox, professor of sustainable agriculture at Unity College. It kills bees, reduces biodiversity, drives heirloom crops to extinction, and requires excessive processing to transform it into high fructose corn syrup, another ingredient found in processed foods (which should be avoided anyways because they contain palm oil). No doubt there are many other foods that should be added to this environmental blacklist, but banishing these five from one’s diet is a good place to start. Located in a San Antonio, Texas community, the house, made from a standard 40-foot shipping container (320 sq ft), stands in the backyard of a renovated warehouse. The blue-painted container is equipped with heating and air-conditioning systems and its roof is filled with plants to help keep temperatures down inside the building. James Law has designed a different office building commissioned by Vijay Associate. This project is entitled Cybertecture Egg and is supposed to be completed by the end of this year. 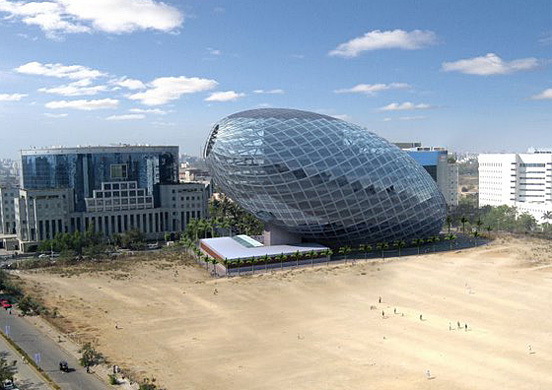 The Cybertecture Egg is a Cybertecture building that brings together iconic architecture, environmental design, intelligent control systems, and evolutionary engineering to create the most innovative building for the city of Mumbai and for India in the 21st Century. It comprises 33,000 square meters of office space stacked in 13 stories with highly intelligent building management systems and 3 levels of basement providing 400 car parking spaces. The Cybertecture Egg adopts a diagrid exo-skeleton, which creates a rigid structural system and thus allows for huge spans of column-less floors. Everything about this ridiculously high-tech office building is cool. A sky garden for “thermolysis” – a natural process where growing plant dissipate heat from the building, cooling it naturally; PV farms for electricity source providing; Water recycling system to recycle up to 20% of the water supply consumption. Moreover, advanced systems as intelligent glass facade, underground water cooling system, building management systems are all equipped so that inhabitants inside will enjoy a perfect environment. There are tons of perks for people who will be working in this building. Office workers will be allowed to customize the views from their desk to show anywhere in the world and see real-time scenery from across the globe. Innovative health monitoring systems will also be installed in all the bathrooms that will keep track of worker’s blood pressure and weight, and if there are any significant changes a doctor is automatically notified. Maybe a touch invasive, but it seems like the architects have their hearts in the right place when it comes to looking out for the office workers. The old half-demolished Bay Bridge that once connected San Francisco to Oakland is about to get a new lease on life. While thousands of tons of steel and concrete will be shipped to China as scrap, a local entrepreneur is planning to recycle big sections of the bridge into a multipurpose building called the Bay Bridge House, which will resemble its original bridge’s form. In a bid to save as much of the National Historic Monument as possible, an architecture contest was launched last fall to help establish the design, which aims to be as green as possible. Following a whole host of ideas on how to recycle the parts, this winning design was announced. The Bay Bridge House will become a museum and an apartment that will be rented to cover costs. The design itself is intriguing. The ‘mini-bridge’ concept will use a huge amount of steel – enough to build around 1,600 cars – for the frame, while the floors will be built using the former pavement. Lane markers will still be included, giving it a playful edge that ensures nobody will forget the building’s history. As well as reusing these materials, the design will have an array of sustainable features, such as rainwater recycling, solar energy, and a green roof. In the end, the home is expected to earn a LEED green building certification. Where the Bay Bridge House will be erected remains unknown. But with so much heavy material to shift, the bridge shouldn’t be going too far from home. 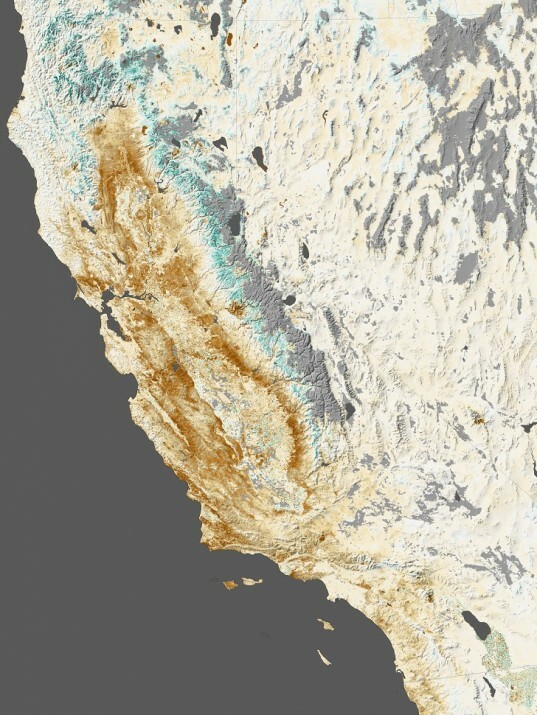 A newly released NASA satellite image taken from space shows the extent of California’s worst drought since record-keeping started in 1885 and potentially the region’s driest period in 500 years. The data from the Moderate Resolution Imaging Spectroradiometer (MODIS) on NASA’s Terra and Aqua satellites vividly displays green areas that are supposed to be white with winter snow cover and brown areas that are supposed to be green with plant growth this time of year. The evergreen vegetation near the Sierra Nevada mountain range is usually covered with snow in a normal year. Most of the rest of the state — from the San Joaquin Valley to San Francisco to Los Angeles and beyond shows areas suffering from drought stress or left fallow because of lack of water to grow crop seeds. Brammo did for electric motorcycles what Tesla did for electric cars by creating a high performance vehicle that is both environmentally-friendly and aesthetically pleasing. For 2014, the company has gone above and beyond to make their new Empulse model lighter, faster, and even kinder to the earth. What’s more, because the bike now meets EU regulations, it will soon go on sale in the UK and across Europe. Aesthetically, the bike is very much the same as the original model, but it weighs 10 pounds less and reaches a new top speed of 110 mph. Two Continental SportAttack tires, which keep the bike glued to the tarmac and enhances performance, while an adjust riding position provides added comfort and control. The Empulse has the same water-cooled engine and six speed gearbox that was in last year’s model, which ensures the same great efficiency and reduced running costs. Its battery charges from 20 to 80 percent in under two hours at a Level 2 public charging station and boasts a city range of 128 miles and 58 miles on the highway. Riders who hit both can expect an 80 mile range. A redesigned LCD dashboard, which includes vital information such as speed, rpm, battery charge, energy usage, and estimated range, makes it easier to keep track of the bike’s performance while in use. But don’t worry: despite the enhancements, prices will stay the same. The Empulse will go for $16,995, while the Empulse R will cost $18,995. In the off-chance you’ve never heard of Brammo, it might be time to check them out, especially if you have an interest in high-performance vehicles that any adrenaline junkie would be proud to own. Two and a half years after a near meltdown, the Fukushima nuclear power plant is still in trouble. The Nuclear Regulation Authority issued a new warning Wednesday, raising the severity level of the continuing leak from one to three on an international eight-point scale. 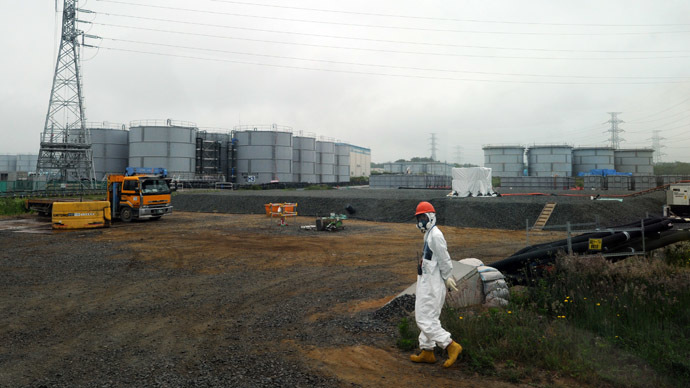 Ever since the devastating 2011 Tōhoku earthquake shook the area, the Fukushima Dai-Ichi nuclear plant has been subject to numerous leaks and controversies. The alert comes as TEPCO (Tokyo Electric Power Co) found at least 300 metric tons of radioactive water to have leaked from the site, with ‘hotspots’ found nearby. Workers are now scrambling to check an additional 300 tanks that currently contain contaminated water at the stricken nuclear power plant. Each point on the International Atomic Energy Agencies eight-point scale of the scale represents a ten-fold increase in radiation, so a jump of two points is highly significant. The latest confirmed leak, from a tank which can hold up to 1,000 tonnes of water, hasn’t been stopped yet and TEPCO acknowledges that they have yet to identify the cause of the leak. TEPCO has stated that there is no evidence that the contaminated water from these leaks has reached the ocean, but there is significant contamination to the soil in the area, which will need to be addressed. The prime minister of Japan, Shinzo Abe, has expressed a loss of confidence in Tepco’s ability to deal with the situation, and has stated that the government will be stepping in to take additional measures to address this continuing disaster. Tepco has also been criticized for delaying the release of strontium-90 levels in local groundwater despite demands from regulators.